Today, A’ Design Award & Competitions announced its call for entries for the latest edition of the Packaging Design Award which is open for entries of creative and innovation packaging designs. Packaging designers worldwide are invited to take part in the competition by submitting their package designs online and demonstrating their design skills through their works. Previous winners of the Packaging Design award can be accessed from the award category page at adesignaward.com, or could be also seen through awardeddesigns.com which also displays winners in other categories. Submitted works will be judged by an academically lead jury panel, composed of university professors, business professionals and focus group of end-users. Nominated designs will be selected according to form, functional and emotional aspects of the packaging; the designs are considered for their degree of innovation, aesthetic qualities, material choices, functionality and usefulness in addition to ease of realization and realization efficiency, ergonomics and human interaction. The Packaging Design Award was conceived to honor designers through international coverage and publication opportunities. The award aims to attract the attention of packaging media to award winning packaging designs. Winning entries will be published at the A’ Design Award yearbook and will be physically exhibited at Italy and will furthermore receive free communication and publication services from A’ Design Award in addition to the award trophy, certificate, badges, logo and other services that are provided to award winners. 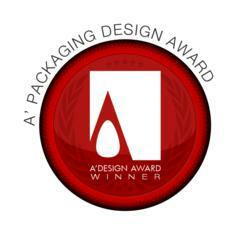 Unlike any other awards, Packaging Design Award Winners are not obliged to make any further fees for claiming the award, and will receive free of charge, all the benefits as listed in adesignaward.com. Prospective participants can apply online at adesignaward.com by paying the one time nomination fee of 375 Euros. Participants are required to upload high quality images of their work among with a brief description of the projects.